Today, meanwhile we are leaving the base camp, arrive the worst news from camp 2: a member of international expedtion died descending from the summit. The news reported that other two people are in difficult condition in camp 2, waiting for help. update october the 5th: the Field Touring website confirm today the fatal accident. Guy Lavaille died on Cho Oyu in the early morning of october the 3th. Our deep and sincere condolences to all his family and friends. No Cho Oyu summit this year for us. But we know, it's life. Tomorrow we'll leave the abc with the serenity that we had before this great adventure. Nicola e Frabrizio in Camp 2 ! Nicola and Fabrizio are now in Camp 2 at 7340 meters. A difficult climbing today but finally with good weather and a great sun. Strong strong wind on Cho Oyu in this last sunday of Septmeber. Great problems for a lot of tents in camp 1 and camp 2. A lot of climbers come down. Fausto and Daniele are now at abc after a night in camp 1.Nicola and Fabrizio will sleep the second night at camp 1 and tomorrow, if weather condition will be better, try to climb to camp 2. Now in camp 2 there are other 2 italians (Giancarlo e Federico) that will come back to abc tomorrow. The weather is good and maybe the forecast seems good also for the next days. We try. Tomorrow the group started to reach camp 1, then tomorrow camp 2, and then... wait for the summit. There are a lot of difficulties but.. we hope. This morning on the north face of Cho Oyu blue sky but strong wind. Fabrizio goes up to camp 1 and tonite he'll sleep at camp 1. The rest of the group will climb tomorrow. Wind and light snow also today. For our small team, two days of rest at abc after the attempt to reach camp 2 yeasterday. Meanwhile we are looking the weather forecast and maybe we hope for the next week end. New week in Himalaya and finally Cho Oyu gives as a present a wonderful morning. Departure at 10 am in direction of "camp 1" with the last thinghs to settle "camp 2" tomorrow. Born in Castelnovo ne' Monti. Skilled in mountaineering, climbing and ski climbing. He lives in Castelnovo ne’ Monti. Member of montain rescue team for over 15 years. Inhabitant of Castelnovo ne’ Monti (RE) he's a Skyrunner, a mountain climber and Ski climber. Born in Montefiorino (MO) he's a ski Instructor and skilled ski climber. The "kid" of the group. Born in Castelnovo ne' Monti, he'll try out two years of Himalayan experience. Residente nel comune di Legnano (MI) è Alpinista e Medico. Ngima Sherpa will be our "guardian angel" in the Cho Oyu in 2008 expedition as it was in 2007 in Nepal on Annapurna. His agency "Pike Expedition" is a small. nice and efficiente family. We'll bring in the HImalayas the blog to communicate with the world below. A little challange, not only technological. Why become a sponsor or partner of Cho Oyu 2008 expedition ? Mountaineering is a clean discipline, humble, hard, loyal. These are the values that will be transfer to your brand. Your investment will be visible and concrete; You we'll be up there with us, on the sixth highest mountain on the planet earth. 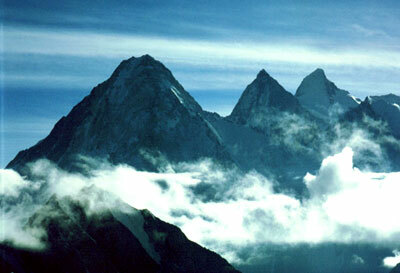 If you want to become a sponsor of "Cho Oyu expedition" please contact us via mail, skype, phone. Cho Oyu 2008 is also a trek flanked to the expedition that will reach with the same route the Advanced Base Camp (5.720 m) and then continue to discover the places, cultures and peoples who live up there, between Tibet and Nepal, in a challenging but equally fascinating journey. In relation to "Cho Oyu 2008" a number of medical-sporting tests will be carried out by the medical components of the group. Our activity on Cho Oyu will also see us involved the first ever trial of a new medical aid device, which we will try out in an extreme environment. A “solidarity” project related to schools is currently being defined with Nepalese organisations. The Appennino Reggiano (the mountains of the Province of Reggio Emilia) is our land and when one speaks about his/her own land at times there is a risk of exaggerating with the amount of praise. If it should happen, take it as just a symptom of affection, because the sky under which you are born tends to always be a better shade of blue than any other sky. Well, almost. Even if the Reggio Emilia mountain range is not the Himalayas (oh no, it definitely isn’t), it is certainly a beautiful, fascinating and pleasurable place. A unique location, in terms of sites, sky-lines and complexion, starting from the strange and enormous stone called Pietra Bismantova, which was put there who knows how and who knows when. More informations in english about Appennino Reggiano.